Figure 2.29. A) Rana pipiens. 38 mm SUL. Collected 19 September 1997 at the NEY site in LeSueur County by Minnesota Pollution Control Agency field biologists; B) Rana catesbeiana. 50 mm SUL. Collected in California during the 1997–1998 field season. From Lannoo, M.J. 2008. 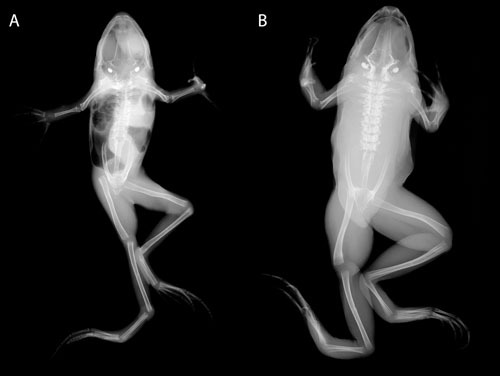 Malformed Frogs; Copyright University of California Press.